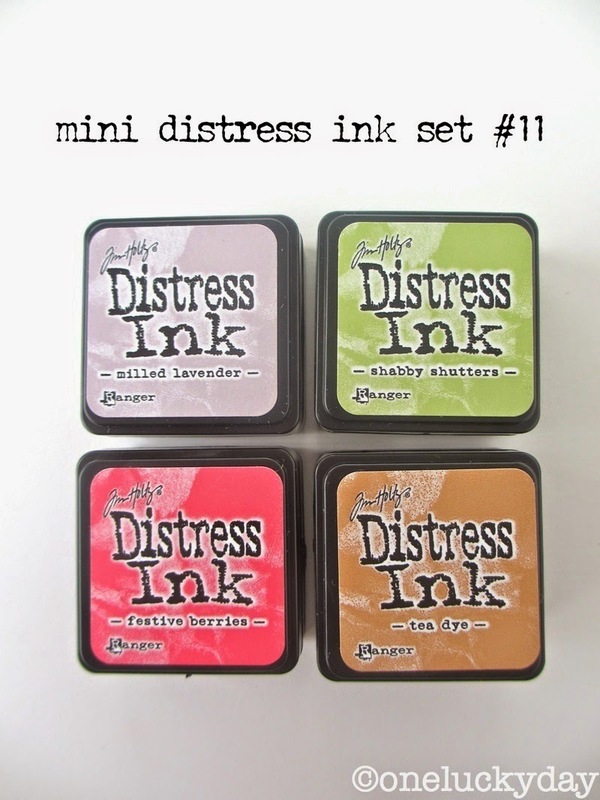 The last three sets of Distress Ink Minis are here! Don't forget to number the back of the ink pad so sets can be put back together once the packaging is opened. 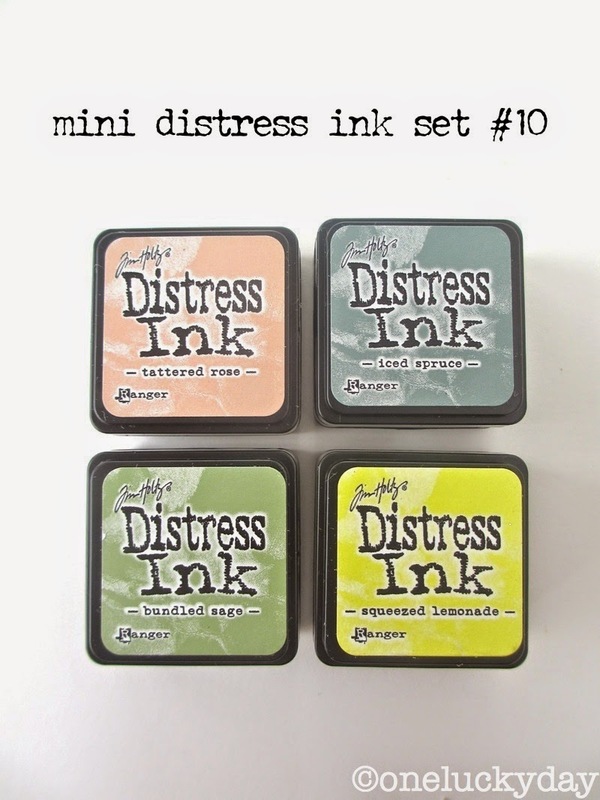 Tim has given me one of each of the new Distress Ink packs to give away on my blog. Please leave a comment on which is your favorite pack! I will pick 3 winners on Monday the 18th. So be sure to come back on Monday to not only see if you won, but to check out a fun tutorial using one of the new sets. It's just a little bit grungy. my favorite package is #12 (but I love them all!! Love set number 11! Thanks for the chance. It's always fun fun to see the mixes. Oooh! I love set 10...I've been waiting for squeezed lemonade. Thanks for the chance to win! I think set 12 is my favorite. I've been using the sets I have lately with the Festive Layering Stencil…..love the look!!!! I can't wait to get more sets! Thanks to you and Tim for the opportunity! #9 is my favorite, but as always, they are all very cool! I have been working at getting the numbers on the back of the regular size pads as well, so I can use the groupings while I work on obtaining all the mini sets! Number 11 is my favorite; but I love the all!! It is fabulous to see them all combined on the different stencils, Paula. Thanks for the visual!! Oh. My. Your example for set 12. Excuse me while I swoon. I think I see my future favorite set. Also, the reverse stenciling is fab - I do that more with my stencils than the other way. Thanks for the chance at these. All the sets are awesome...just like your samples! It's so hard to choose 'just one' because all the colors work so well together. However, when 'push' comes to 'shove' at a time like this, I'd choose set 12. Keeping my fingers crossed...hubby's birthday is Monday...hope this brings me extra luck! my favorite was the set 11, and i come back for see your tutorial, thanks for the info! OH, more goodies from Tim, does he ever stop. Want the three new minis to go with my other precious little darlings. Beautiful Stenciling, and I love your tags. Thanks for the chance to add to the stash. They're all great! But... I use Tea Dye and Shabby Shutters *all the time* so if I have to pick, #11 is my fave. From these three sets...I like #11. Festive berries is the bomb! great idea to put the number of the set on the bottom of the minis. thanks as always for sharing. I love anything Tim Holtz or Ranger, you have made some beautiful tags to share with us. If I had to pick one, it would be #12, but I love all three sets. #10 is my favorite, mostly because of the Bundled Sage!! #10 is my favourite set - the one with bundled sage. The packs make it easy to select colours for a project. I love that iced spruce too! Sigh - it's just a fabulous color!!! #9 is my favorite but it is so hard to pick. The tag you did with set #11 is to die for, I love it. I would have to say that it is my favorite. Those little ink pads are so cute. As a set I love #12 but Iced spruce is one of my favorite colors! Love your tags! #10 that's my favorite, love all the little goodies, they are just a great usable size! i'm going with #10...and love the new size! i can't wait to get my hands on all of them!!! I love what you did with set #12, those colors look great together. You've showcased the colors perfectly--way to stencil! It's brilliant that Tim grouped together compatible colors and my fav from this bunch is No. 12. Those tags are beautiful! First choice #10, second #11, third #12. I think you used iced spruce the most. Great way to use those stencils!!! Bold colors are us!!! My fave is # 12 ! But love and would use them all! I don't have any of the colours in #10 so I would pick it if I could only have one set but there are other colours in the other sets that I also don't have so any one of them would be fine. LOve the examples & can't wait to see the tutorial. I don't have any of the colors in set 12 and I love how the tag turned out! Those sample tags look gorgeous. The more I see them, the more I want those adorable mini pads! Beautiful tags! I would love a chance to win one of the new sets. I love Distress minis!! Great use of them in making your tags!! Swoon, love the colors and that first stencil! They are perfect partners, aren't they? Thanks for the chance to win some minis! I love distress inks and these minis have so many great uses. Thanks for the numbering tip. Your tag samples are super. Can't wait to see more! Without a doubt Set #10......the demo with the Gothic stencil did IT for me!!!!! Love the color combinations. Would love to win them. they are sooo cute. My fav is set 12!! Those tags are gorgeous! Love these new minis! Crushing on set #10. So vintage looking with that gothic stencil. Thanks to you and Tim for the giveaway. Hmmmm, a grungy project I'm guessing you used brushed corduroy the most. Have a great weekend. My favorite is #12. So pretty with that Festive stencil. Number 10 is my favorite. I love how you simply made tags with the color groups tim made. I've been doing the same thing (marking the numbers of the set)--think I got that idea from Jennifer McGuire. Well, if I have to pick one as my favorite, I guess it would be #11. Set 12 has my fav colours! Would love to create with these. I would love to play with set #11. #10!! it's my favorite combination. so soft and nostalgic. thank you sp much! I think it would be # 11. 11 Eleven #11! Festive berries, shabby and tea dye all in one set? Perfecto! Cute sample, thanks for the inspiration! I love set #12. I love the vibrancy of the colors. Tough decision! I love the tea dye with the festive berries so I have to go with #11....thanks for a chance to win these! Oh! I've been waiting for squeezed lemonade to come out in the mini. I want that set. I think I like set 10 best. Those colors together are really spectacular. Thanks for the chance to win some goodies! set #11 is my favorite!!!! Have 3 sets so far... Thinking I need them all eventually! LOVE the colors in #10!! I like them all but #12 is my favorite! I really like the aged mahogany♥ Looking forward to see what colors you used!! My favorite set is #12...and I just love what you've done with the stencils!! I love the colors you chose for your tags. They look great with Tim's stencils. I love all the distress colors but I especially like the group with the brushed corduroy. All those yummy colors, very autumn-like. thanks. I love them all. You selected perfect stencils to highlight the color combinations! These mini are so nice to use with the stencils!!! Can't wait for Monday's tutorial!! #11 in this grouping as I love "Shabby Shutters". Any shade of green along with shades of purple and yellow are my must haves in any medium. AND, it doesn't hurt that the #11 is the day of the month that I was born. Oh, happy day! Fave is set 11 but they are all great! Oh goodness! I love them all..set 10 is my fave of these. That you for the chance to win! Dear Paula, Set #10 is my favorite one! I really need them all but if I have to pick 10. I love set 10. I don't have any of these colors in ink pads. I have stain, but no ink. My stains need their inky partners! Oh my gosh, I audibly gasped "ooh!" when I saw the first tag! Those colors are so beautifully complimented using that stencil! Thanks for sharing! Kit #1 is my favorite, but #5 and #7 are close behind! Love them! Set 11 for my choice! they all are wonderful but i really love # 11. I really like set #11 as well as that Festive layering stencil. Thanks for the chance to win one of these sets. Fave? #11, no wait, it's 12, hold on, got to be 10. YOU pick just 1 Paula! ok, it's 11. I like #12. I really need to ask for the stencils for my birthday! Thanks for sharing! Love the new mini sets.... 11 is my favorite! Of the sets shown l'm loven #12 then #10; #11 and thanks for the sample tags it really helps. These look like so much fun. Love the look with stencils. Your sampler tags are SO BEAUTIFUL Paula - the stencils & ink blends work perfectly together, no further embellishment needed!!! As for the new minis, they're ALL GORGEOUS!!! ... I've never met a Distress Ink that I didn't LOVE. My favorite new set is #10 - LOVE LOVE LOVE the colors inside. Those tags will make great backgrounds. Ranger sure knows how to pair colors well. Thanks for sharing! ! Beautiful colour combinations, it's so hard to choose a favourite but I think #10 is my favourite. Thanks so much for the opportunity to win one of Tim's new mini releases! it's difficult of choose, but my favorite is 11, every set of colors 're beautiful. The very nice work which the stencil..
Ooh! Those samples are just delish :-). I've still not got a favourite favourite, I just love 'em all! loving all of them but for some reason i'm drawn to #12! Definitely #10! I love those soft colors! Wonderful tags! I love them all but I think seeing the way you created the different tags I like 10 the best. Seeing the melds of colours are so cool. Thank you! I say #10, even though I am a fan of the darker tints, this collection looks perfectly matching my darker ones! Love that you showed the color combos together. Ik heb zonet jouw blog ontdekt via pinterest. Wow leuke effecten met de kleuren en de stencils. Ik waag graag mijn kans en vind elke reeks even mooi! YUMMY, I think those mini's look like candy and i would love to try them!! Your samples are beauiful. I love #11. I love them all, but #11 has great colors. Thanks or the chance to win. I think my favourite has to be No. 12 - thank you for showing the combinations together, the samples are wonderful. Thanks also for the chance to win! Set 10 is calling my name if for no other reason than I HAVE to have Squeezed Lemonade in a mini! Squee Indeed!! great color sets..love your samples. No. 12 for me - great colors for Christmas cards! Love those minis. Oooh what beautiful tags! It is really, really hard to choose a fav set but I think I would have to go with set #11 and I just LOVE that festive layering stencil.......it will be in my collection very soon! Such a great way to display the new colors!!! These are all beautiful but I like set 11 the best - especially seeing it through that stencil. Oooh! I love set with number 10... that one is definitely my favourite. Love your tags! Simple technique with a lot of POW! If I have to choose... I like set #11. I love these so much! Great idea numbering them on the back. Love #11. Festive berry! Very cute tags. I really like set 12. And the stencils, where have I been, they are fabulous! set #10 is for me. .... and that gothic stencil is also something I will be picking up when I see it. thanks for the chance to win inks. Thanks for a chance to win the minis, I really love this size for so many reasons. #12 is my favorite. I love the color combo. You have used all of the sets in a beautiful way, but I think #12 is my favorite. And I love the hand knitted stencil. On my wish list now. I love the way you've used these minis....I like #11. I look for these at the craft stores in my area; but to date, I haven't found them. Thanks for the chance to win them. I just love Set #11, it has four of my favorite colors. They are all beautiful. But my favorite is #11. Followed by #10. #10 caught my eye right away! #11 - I never would have thought to add the lavender into that color palette but your sample shows how beautiful the colors all work together! the stencil with set #10 is amazing! Thanks for the chance at these,I'd choose set 12. I think #10 is my favorite, but of I can see myself using each and every one of them. I think you used the festive berries the most, am I right????? The colors are so pretty. Love the stencil patterns. So hard to choose! I think #12 is my favorite- love the aged mahogany. Love what you did with set 11, stunning! I think you used Festive Berries the most. That is what I would do anyway. Thanks for the chance to win a set of these inks. I love the minis! A favorite? Love them all but the Aged Mahagony is my ultimate so it has to be that one for me! Love the stenciled colored too!!! love them all:0) thanks for the chance to win! Winner, Winner, chicken dinner! Love the new minis! I love what you did with set #12 and that awesome Holiday Knits stencil...I better get another job to support my scrapping habit! Thanks for sharing and the chance to win! My favorite is #12. Love the Holiday Knits Layering Stencil. Oh My Gosh! Can't wait for them to be released to the stores! My favorite is #11...but ya just know I gotta have them all...LOL! Thanks for a chance to win a set! geez.....trying to pick just ONE? it's like trying to pick just one flavor of ice cream when what i'd really love to have is a triple decker. but if i HAVE to choose just ONE....right now set #11 appeals to me as autumn approaches. but that #10 just calls to me. see what i mean? thank you for SUCH a generous giveaway. i can only hope. They are all such amazing colours but if I have to choose one, it will be #10. Lately I have been loving everything pale. Lovin' set #11!! Thanks for the chance to win!! Great looks with great inks. Thanks for th opportunity to win these little pads. Love them all, especially set #11. Your examples are lovely! Definitely #10 for me. Love all the pastels and they look great with that stencil! This is so exciting, woooo hooo more minis!!! Love your idea to number the backs of the pads so we can put the sets of colors easily back together when we want to. Great idea! OMG--slap to the head!! Numbering the bottoms of the Mini's!! Genius, Paula!! DUH!! I've been thinking to myself--'Now, how am I going to remember which set is which?" I know what I'll be doing today!! I think, with this latest release, Set 10 is my favorite. But, it could be because I'm partial to yellows ;) Thanks for giving us a chance to win the latest Mini's Paula!! XOXO-Shari T.
Your samples are beautiful!! Love how you used each set with the stencil! Set 10 and the Gothic stencil are my faves...today...LOL! Tomorrow it will be something else...LOVE all the Distress colors!! Am so glad to see the last ones out. The are the best and you advise for numbering them is great, I already have my labels for the tops and bottoms printed so all you have to do now is draw my name and I will be doing the Happy Dance. Love the new color sets - great tip to number them! Looking forward to your tutorial - thanks for the chance to win! I love them all but 12 is my favorite! Set 10 is probably my favorite, but they're all so wonderful! Set number 10 is my favorite. The soft colors are fabulous. wow. #12 is my fav. loved the stencils you used with each set too! Well if I have to pick then it would be set #10 but of course I love them all..! Wow, thanks for the chance to win these beauties! Beautiful tags! I love #12 (ok and 13 too) the best, but how can you choose?? I love them all. I love your tags and looking forward to monday with you. I am an intense color girl and would go with #12 as my favorite. I love the fall colors in #12. Beautiful tags. I'm guessing the festive berries is the color you used most! What I especially liked about visiting the different artists were the different products used!! I get to practice with the products I have at home, but have to wait for the inks to make them look like the samples!! Thanks to Ranger and Tim Holtz for the chance to win! 12 is my fav. Love them all tho! Really I love them all!!! I think I would choose # 11 after viewing your masterpieces. That would be one of my first choices of sets to get. Love how you profiled the stencils, I have been thinking about getting them and now I can see I must! It is like picking your favorite child...you love them each in a special way. But #12 really is pretty!! Can't wait for your up-coming projects ! These samples are YUMMY! Easy to pick - #10 because it has the Squeezed Lemonade that I have been waiting for. It is sad but now we can get every distress color in a mini! I love the color combinations of these three sets but the rich colors in #12 make it my favorite! #10, #11, #12, oh decisions, decisions, decisions, I don't like making decisions, I LOVE THEM ALL !!!!! Oh my goodness, I love how each set mixes and mingles together so nicely! They are all gorgeous. I love your tip on marking the sets. Awesome! My wish list for Christmas just keeping longer and longer. I love the way you've used the stencils to show the color sets of Distress Minis. I've been keeping mine in the sets and numbering them since the first time I saw the idea on your blog. I think the Gothic Stencil is my favorite stencil so far and it is perfect with these colors so if I've got to pick a favorite set from these I've got to say set #10. I'm thinking you used more Festive Berries but then it is a strong and beautifully bold color. These are so fabulous! #11 is my fave of these. I love how you used each set together on a tag! It really showcases the colors as a set. set 11 would be my favorite because to the brightness of the colors and it has festive berries, a lovely red ! Thanks for sharing these minis by using the combinations on one tag, so we can see how good the combinations fit each other !